In this episode, The Traveling Trio checks out Český Krumlov, a medieval town in the Czech Republic. They'll start with a tour of the Krumlov Castle and the castle tower. Then the Trio will feed some huge brown bears by hand. They'll raft down the rapids of a rushing river and go deep into the Earth to see how graphite is mined. There's a lot more to see and do in Český Krumlov, so grab your passport! 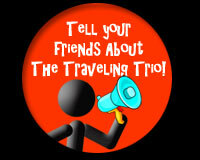 Come along on an exciting adventure with The Traveling Trio, an educational series presented by three siblings who traverse the globe while exploring, learning and teaching viewers about our amazing world and all it has to offer. Olivia, Ingram and Everett venture into dark forests, explore the ruins of medieval castles and make new friends as they travel from country to country. The Trio visits both famous landmarks and off-the-beaten-path attractions while educating their peers on the geography, history, language and culture of exciting foreign destinations.